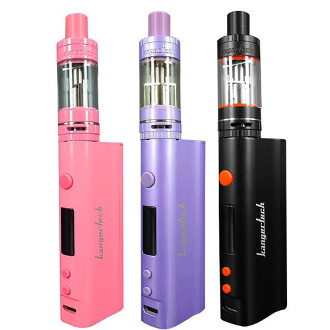 The Kangertech Topbox Nano kit is a cute and compact Mod that gives you tons of vapor. Proving its not what you have, but how you use it! The Topbox Nano kit will come with Kangers newly designed Top Tank Nano. The Subtank Nano now fills from the top, allowing you to avoid awkward fills and keeping you from stripping your threads faster. The kit also features the pass-through digital readout Kbox that has an output of 60 Watts! The Kbox will match perfectly with your new SSOCC coils in .15 and 1.5 ohm. And with its new temp control feature you will be able to customize your Topbox Nano kit to your perfect vaping experience. With the Topbox Nano kit you wont have to worry about lugging around some giant Mod, its small stature is nothing to mock once you experience its mad vape skills!